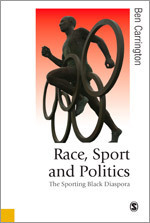 Simon Dawes interviews Ben Carrington on his recently published book, Race, Sport and Politics: The Sporting Black Diaspora, published as part of the Theory, Culture and Society Book Series (Sage, 2010). Simon Dawes: Your book begins with an account of the creation of the ‘black athlete’. Could you tell us about this very specific event and the extent to which it represented something new? Ben Carrington: In Race, Sport and Politics, I make the argument that the idea of ‘the black athlete’ was created at the beginning of the twentieth century, and more specifically that this originatory moment can be dated to December 26th 1908. This historical marker is well-known to boxing historians as it is the date when the African American Jack Johnson wins the men’s heavyweight boxing championship. Johnson beat the white Canadian Tommy Burns becoming the first black heavyweight champion at a time when white supremacy was premised on the idea that whites were intellectually, aesthetically and physically superior to blacks. So Johnson’s victory - which took place in Sydney, Australia and made front-page newspaper headlines throughout the colonial world - was a potent and symbolically powerful anti-racist statement against a central tenet of white supremacy. Put simply, Johnson’s emphatic wins in the ring made it hard for the supporters of Jim Crow to claim innate supremacy over blacks in matters physical and sporting. Each Johnson victory delivered a further blow against Jim Crow racism and the racial common sense of the era. However, I also suggest that Johnson’s achievements led to the eventual creation of a new racial archetype that I label ‘the black athlete’. The meaning and potential threat to the system of white colonial racism posed by Johnson had to be contained by changing the meanings given to physical strength and sporting achievement. So a shift within racial discourse within the west begins to occur in the years during and after Johnson’s reign as heavyweight champion (1908-1915). This change becomes even more pronounced once we reach the 1930s with the success of two other African American athletes, Jesse Owens in track and field and Joe Louis in boxing. This ‘new’ race logic suggested that blacks were now in fact superior to whites in matters sporting, that the black body had a special dispensation for running, jumping, climbing, throwing and so on. This new articulation, or what borrowing from literary studies I call a trope, produces our present day idea of the natural black athlete. Two things happen in this moment. First, a sharp distinction is drawn between the body and the mind. Whereas classical forms of racism had posited the inherent interconnections between the strong body being the outward manifestation of higher cognitive development - muscular Christianity being a good example of this ideal, strong in body and strong in mind - now racial discourse worked to hyper-accentuate a split between sporting physicality and intelligence. Blacks became creatures of the body and the body alone, helping to further consolidate colonial myths that sought to connect black Africans to the animal world rather than with emerging human civilizations. Second, the idea of the black athlete becomes a very powerful trope enabling a whole range of beliefs about primitive and savage blackness – violence, hyper-sexuality, aggression and so on – to be reproduced in a seemingly benign form, that is in the lauding of black athleticism. It’s also important to note that as a result, ‘the black athlete’ becomes a kind of hyper-black representation, the quintessence of blackness if you will. In other words, the trope is not just a way to describe particular individuals who happen to be black and athletic, but a way to frame the identities of all black people, the notion that there is an athlete hidden inside every black person, regardless of their actual physical dexterity. SD: To what extent is the idea of the ‘black athlete’ contradictory, and to what extent is it ‘not about blackness at all’? And why is it important to think about this in terms of colonialism instead of race? BC: Well the idea of the black athlete is contradictory because it is a mythical representation that attempts to do the work of white racism in collapsing a heterogeneous collectivity that we call ‘black people’ into a set of identifiable and typical characteristics. It is a good example of how discourse operates. The object – ‘the black athlete’ – is actually constituted by the belief that there is such a thing. A range of institutions from sports science, to education, to the mass media and so on, enable a series of experts and commentators to produce knowledge about ‘the black athlete’. Tracing when ideas about black physical ascendency emerge helps us to understand that such discussions reveal more about those making such claims than it does about those the studies and discussions claim to be about. Put another way, the invention of the idea of the black athlete is actually more about white fears of blackness and the fragility and instability of the colonial order - as Frantz Fanon so expertly maps in Black Skin, White Masks - than about any existing characteristics or propensities of ‘black people’ and ‘the black body’. Thus the construction of the black athlete was actually a way to define and shore up the boundaries of white identity. The search for a ‘Great White Hope’ to defeat Johnson helped to produce whiteness. The call, remember, was not for an Italian American or an Irish American or a Polish American, divisions that were often significant in nineteenth and early twentieth century America, but for any white male boxer to take back the mantle of hegemonic masculinity, embodied in the heavyweight champion, from Johnson. Such racialised calls enabled those European migrants who were not quite white to transition from their various European ethnicities into racialised whiteness. To the second part of the question, I’d like to rephrase it slightly. I don’t see my argument as displacing a discussion around race by replacing the race question with the colonial question as if there was a trade-off to be had between two different, separate systems. Rather, the attempt is to think about how colonialism provides a framework for thinking about the emergence of the modern idea of race. The powerful and far reaching sets of global social relations and inter-connections, and therefore human interdependencies as Norbert Elias would put it, that begin to structure much of the world from approximately the late 15th century onwards, the violence that underpins forms of European governance of non-European lands that emerges soon after, the expansion of capital trading routes and of capitalism itself, alongside the formation of nation states and the related issues of sovereignty, individual rights and democracy, provide the socio-historical context within which to think about the emergence of the idea of race (and related, the human) and how racism operates. Thus the term ‘colonialism’ is a useful way to think about these very broad, complex and wide-ranging social processes that impact and reshape just about every aspect of life both inside and outside of what we call ‘the west’. Or put slightly reductively, attempting to discuss race without an account of European colonialism would be as big a conceptual mistake as trying to understand class outside of and separate from the historical formation of industrial capitalism and capitalistic social relations. This raises a broader analytical point concerning how to think about the problem of the proletariat and the colonial problem, as Aimé Césaire famously put it, in relation to one another, a question that has been central to radical black Marxist thought for a century now and that is implicit in my discussion, though perhaps not as explicit as it could be. SD: A number of recent theories have attempted to reconstruct the history of colonialism in a less negative light. There’s also (in more popular discourse) the post-racial mantra of the Age of Obama, the simplicity of which you critique. BC: Extending the comparison I made with the last question, it’s undoubtedly the case that we are living through a different set of challenges that the latest period of racial formation produces, just as capital operates in markedly different ways today than it did during the stage of industrial capitalism that Marx so expertly analyses. I have no problem in thinking about the present in terms of the post/colonial. My use of the virgule in writing the post/colonial in this way is deliberate. It calls attention to and marks the ambivalent tension between on the one hand the surpassing of colonial relations (most if not all of the mid-twentieth century European colonies are no longer directly controlled from the metropolitan centre) and the other position that posits that little if anything has changed and we are essentially still in the colonial period. I like the and/or either/both implications of the virgule (and also its use as the end/continuation of a verse) as it implies that both positions may be correct depending on the region or area or time that we are talking about. It forces us, in other words, to be a bit more specific with our arguments and to be cautious about, or at least acknowledge the limits to, certain general claims about ‘the post/colonial’. That said, I do think we can find more continuities than discontinuities within western racial formation once we push past the smokescreen of liberal racial tolerance. For example, even a cursory reading of how the right in the U.S. have tried to ‘frame’ Obama as illegitimate, the questions surrounding his status as a citizen, the accusations from the likes of Dinesh D’Souza that Obama has an anti-American/anti-west mentality that derives from the bloodline of his Kenyan father’s anti-colonial/anti-British politics, and so on, compels the serious analyst to think about how colonial relations and ways of understanding the world through a ‘white colonial frame’ continue to structure how we see, feel, read and react to race. Thinking about places like Canada, Australia and the U.S., for example, as white settler states and the continuing forms of dispossession of native peoples’ lands is a necessary analytical and political move that we should not be afraid to take. As for those, like the revisionist historians Andrew Roberts and Niall Ferguson, who have argued for the merits of colonialism and in the latter’s case called for a more explicit new American Empire, I have to say that I simply don’t take them very seriously, though I fully understand the impact of their ideas in fostering the agenda of U.S. neo-cons and their European acolytes. Colonialism always had its official historians. La trahison des clercs is not a new phenomenon. I think Stephen Howe’s review essay at opendemocracy a few years ago provides a comprehensive rebuttal of Ferguson’s work and by extension the other apologists for white colonial racism. That a figure as far to the right as Ferguson was apparently invited to help re-write the British history school curriculum by the coalition government is both predictable and depressing. SD: You discuss the history of representations of race in sport from the mid-19th to the early-21st Century, but you also do much more: you explain how sport actually reproduces race. Could you tell us a little about this? And how do representations of race in sport differ today from 150 years ago? BC: As I mentioned earlier, one of the consequences of the creation of this new racialised trope - the black athlete - was a challenge to one important component of white racism’s claim to physical supremacy and the subsequent shift within racial common sense more generally. This is significant because I am making the argument that sport, at particular moments, can actually act as, what the U.S. sociologists Michael Omi and Howard Winant term, a racial project, in effecting a wider shift within racial formation, and not just how racism impacts sports, which is what most studies on sports and race seek to show. Sport, in other words, serves to shape and reshape race; it becomes an important space for race making. Today it is interesting how often sport is invoked by its boosters, both liberal and conservative, to demonstrate how we have become a post-racial society and how the success of some, normally male, black athletes reflects the progress that has been made in challenging if not quite eradicating racism from wider society. There is, of course, some truth to these claims. But only some. We tend, for one, to have a very narrow definition of sport from which such arguments are made. Rarely is fishing, or darts, or Speedway racing, or lacrosse, or bowls central to our discussions. So there is a sense in which discussions on ‘race and sports’ get reduced to those five or six sports that most dominate the western sports-media complex, or what I prefer to call the white sports-media complex, where normative whiteness and black exceptionalism get reproduced for mass audiences. This also leads to a distorted focus on men’s elite sports at the expense of female athletes, youth sports in general and the participatory levels of sports in schools, public parks and so on. The global spectacle of commodified and hyper-commercialized sports is why we tend to spend so much time analysing and thinking about its importance. In some ways this means that interventions in and around sports could be even more impactful but professional athletes today tend to have accepted the neo-liberal logic that their role is to be good corporate spokespeople beholden more to their commercial sponsors than to any broader social movement or critical consciousness, even as such athletes invoke the spirit if not quite the actual anti-colonial and anti-racist politics of say, a Muhammad Ali or the symbolism of the 1968 Mexico Olympic protests of Tommie Smith and John Carlos. I also think it is interesting how often today’s black athletes are likely to be represented not as sub-human but super-human with the ability to jump higher, run faster, hit harder, throw farther than other, ordinary (read white) humans. The consuming (white) public are told that we too can perhaps match the physicality of these overwhelmingly black male stars if we buy the correct athletic apparel or drink the right energy drink. In these representations the black athlete is produced as beyond the realm of the human altogether, an interesting move wherein the black subject, once dehumanized now becomes almost post-human, but never allowed to occupy the space of the simply, ordinarily human. Plus ça change, plus c’est la même chose. SD: You read the politics of race and sport diasporically, but, in the case of African-Americans, how significant is the difference between sporting achievements on US soil and those (such as Jack Jackson’s boxing victory in Sydney in 1908, and Jesse Owens’s Olympic victories in Berlin in 1936) on a more global stage? BC: I’m not sure that for American audiences the global stage for the achievements of African American athletes is that significant or well understood. There is a certain American-centrism to African-American politics and culture. That isn’t meant as a criticism and shouldn’t be that surprising at one level but more an observation on the extent to which being located within the centre of the remaining world power produces an identification with the nation even among those most marginalized and subject to the most damaging effects of state power that results in reduced life chances, incarceration and ultimately death. The insularity of the American media, be it sports, news or entertainment, means that diasporic connections inside the U.S. are actually quite limited. Put another way, the successes of African American sports stars have become an important part of what I term, adapting Paul Gilroy’s famous concept, the sporting black Atlantic. Ali, Althea Gibson, Arthur Ashe, Michael Jordan, Jackie Joyner-Kersee, the Williams sisters, Kobe Bryant and so on, are generally well known throughout the African diaspora, their successes reflecting a wider sense of black pride and identification. But you’d be hard pressed to get many African Americans to say much about Pele, Viv Richards, Didier Drogba or Lewis Hamilton. So while African American athletes are an important and even central focus within and for the black sporting diaspora, the diaspora, with notable exceptions, operates in much more restricted and limited ways within the U.S. itself. SD: How respected these days is sport as an object of study? You discuss developments since Bourdieu’s essay ‘Program for a Sociology of Sport’, and suggest a comparison between Loïc Wacquant and Toby Miller. Could you tell us about this, and about any personal difficulties you’ve faced in having your work taken seriously? BC: Well the short answer is that sport isn’t taken seriously or respected as an object of study! The cultural theorist Toby Miller has noted that Loïc Wacquant once confessed that, but for his association with Pierre Bourdieu, his early work (Wacquant’s PhD was based around an ethnographic study of a boxing gym in Chicago) would have been relegated to what Wacquant termed ‘the oblivion of the sociology of sport’. [5. Miller, T. (1997) “‘…The Oblivion of the Sociology of Sport’”, in Journal of Sport and Social Issues, 21 (2), 115-119.] It remains the case that most academics, sociologists, and cultural theorists, have next to nothing to say about sport either as a social institution or cultural practice. At best you might get a passing reference to the summer Olympics or the men’s football world cup in studies on globalization, books on black cultural politics will normally reference O.J. Simpson and Michael Jordan, and post-colonial theorists often feel compelled to note C.L.R. James’s Beyond a Boundary in a single paragraph or footnote, but that tends to be it. Gender theorists do perhaps give more attention to sports, especially scholars of masculinity such as R.W. Connell and Michael Kimmel. And there are some sociologists doing work that garners wider attention, the American sociologist Michael Messner for example has written extensively on gender, politics and sport as has Doug Hartmann on race and sport. In the UK, Richard Giulianotti has worked with Roland Robertson on questions of globalization, there’s Barry Smart’s work on sports stars, and a few years back Les Back and John Solomos, along with Tim Crabbe, conducted a study on race and football. The situation is a little better in Canada and Australia, I think, but not much. So work on sport within sociology and the other established disciplines is there, but it still remains a novelty subject in the eyes of many and something that should be left to Kinesiology departments or Sports Management/Physical Education departments. On the whole the bourgeois habitus of academia helps to ensure that sport falls into the category of ‘leisure’ and hence to the marginalia of the central, more ‘important’ topics. Even within cultural studies, where we might expect to see substantive studies on sport, sport receives little attention compared to say the work done on music, film, television and so on. Pick up any of the recent textbooks on cultural studies, turn to the index and compare the size of the entries on these cultural forms to sport. More often than not sport does not even merit an index entry let alone a chapter by itself. If you are reading a ‘mainstream’ cultural theorist who takes sports seriously then the chances are you’re holding a book by Toby Miller. Maybe as a result of this marginalization the subfield of sports studies is very vibrant with much good work taking place but this just serves, I think, to allow mainstream journals, presses and departments to not engage sport because such work is already being done by the ‘subdiscipline’. It is interesting to note that the one figure who did devote time and energy to thinking and writing seriously about sport, Norbert Elias, tends to be overlooked as a central social theorist in many histories, and especially so in the US, despite the best work of figurationalists such as his collaborator and mentee Eric Dunning. How this has affected how I am seen and my place within the academy I am not sure. I guess I should add the disclaimer that I don’t actually see myself as a ‘sports specialist’, even though I may get framed that way by some. I am interested in the role of culture and especially popular culture as a location for the articulation of identities, the limits and possibilities of political forms of resistance through culture, and related issues of race, embodiment and social change. I think sport happens to be an important site for many of these questions. I move between trying to understand and read the relative autonomy of sport as a particular form of human activity and meaning making to situating sport in relation to other social institutions wherein sport may or may not be central to the question at hand. But that is a theoretical and empirical problematic to be investigated (and not dismissed out of hand in advance) and a question too few so-called ‘mainstream’ scholars are willing to pursue. I am in the unusual position of working within a Sociology department in the U.S. so maybe I get to occupy the token ‘sports scholar’ slot that is randomly assigned within sociology once every ten years or so. But, as I say, my personal ‘marginalization’ (and I don’t think of myself or my work in this way) is not really that important and less of an issue for me than thinking about the place of sports both within society and the academy. I did hear one story recently that shocked me. In the fall of 2010 Yale University held a one-day conference to honour the work of the historian James Walvin and I was asked to speak about Walvin’s books on the history of leisure and football in Britain, which for their time in the 1970s were groundbreaking and important works. Walvin, though, is perhaps better known for his extensive writings on slavery and particularly the British slave trade and slavery in the Caribbean. At the very end, Walvin responded to my paper and the others, by relaying a story. Many years ago Walvin went up for promotion. He asked a friend to look over his application and was advised that if he wanted to be taken seriously and to ensure his promotion went smoothly that he should take off the books on sport from his c.v. This is an intellectual with a scholarly output far in excess of anything his peers have produced and a world-renowned historian of the British slave trade being told to take books off his c.v. simply because the subject matter was seen to be so lacking in serious academic credibility – regardless of the content remember – that it would adversely affect the perception of all his other writings! If that is what friends are willing to tell a figure as brilliant as James Walvin then I shudder to think what is said of my work and others who write on sport! That said, I do genuinely believe that such ignorant and often class-based dismissals of work on sport says more about the person making such claims than the work I or others do. If we begin to second-guess what others think of our research we can end up in some very strange and intellectually limiting spaces. Whenever this question does come up, I often like to quote C.L.R. James when he writes in Beyond a Boundary, ‘A professor of political science publicly bewailed that a man of my known political interests should believe that cricket had ethical and social values. I had no wish to answer. I was just sorry for the guy’. I’m with James on that one. SD: Finally, what sort of reaction has there been to the book so far? And what’s next on your agenda? BC: It’s been good so far, though with most academic, non-trade, books it’s hard to gauge the immediate reaction. Some early on-line reviews have been very positive, I’ve spoken about the book on BBC Radio 4’s Thinking Allowed with Laurie Taylor and continue to give talks across the US on various campuses. In truth, the impact of the book will be measured not in radio appearances, newspaper reviews or invited talks, but in how it both affects the various fields of study I speak to – cultural studies, critical race theory, black cultural studies, post/colonial theory - and how and if it gets taken up in classrooms, taught, discussed and debated. One of the goals of the book is related less to my own arguments being engaged but the hope that intellectual spaces outside of sports studies, in black cultural studies, sociology, cultural theory, critical race theory etc, will start to take the scholarship on sports more seriously and engage in their own theorizations of sport as an important racial project and a necessary scholarly object if we’re going to make any generalizable statements about race and society. If the book can play a role in that larger project and get people outside of sports studies to read more than Beyond a Boundary, then I’ll be happy. Related to this admittedly rather ambitious goal, I’m currently co-editing a special issue of the journal Qualitative Sociology with my UT colleague Professor Simone Browne entitled The Obamas and the New Politics of Race that should be out in the fall of 2011. I’m also guest-editing a special issue on new ways to theorise sport and race for the journal Ethnic and Racial Studies that should be out by the end of 2012. And I’m co-editing, with Professor David L. Andrews of the University of Maryland at College Park, a Companion to Sport for Blackwell, that should be out sometime in 2012. I’m also working on two book projects. The first will be an ethnographically-based study of cricket, masculinity and identity within the black Caribbean diaspora that looks at sport as a site of racial contestation. The second is a study of English nationalism in this moment ‘after multiculturalism’. Especially in the run-up to the 2012 London Olympics, we are likely to see plenty of discussions about what it means to be English and ideas about race and sports will be central to these debates, so the book will seek to address these issues and show why an account of sport is necessary to understanding English national identity at this particular moment. Both of those last two research monographs will be finished, as they say, when they’re ready. 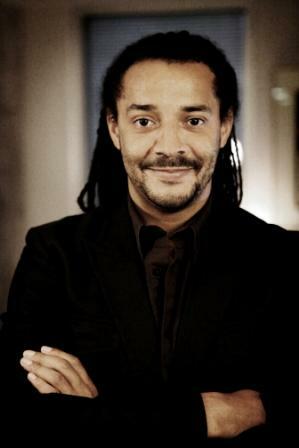 Ben Carrington is an Associate Professor in the Department of Sociology and, by courtesy appointment, the African and African Diaspora Studies Department at the University of Texas at Austin. Professor Carrington is also a Carnegie Visiting Research Fellow at Leeds Metropolitan University. He has produced three books, ‘Race’, Sport and British Society published in 2001 and Marxism, Cultural Studies and Sport in 2009, both co-edited with Ian McDonald and published by Routledge, and more recently the monograph Race, Sport and Politics: The Sporting Black Diaspora, published as part of the Theory, Culture and Society book series by Sage in 2010. Theory, Culture & Society, July 2006; vol. 23, 4: pp. 95-112. Theory, Culture & Society, August 2003; vol. 20, 4: pp. 5-29. Theory, Culture & Society, February 1983; vol. 2, 1: pp. 135-142. Theory, Culture & Society, January 1983; vol. 1, 3: pp. 123-132. Body & Society, March 2010; vol. 16, 1: pp. 193-221. Body & Society, September 2008; vol. 14, 3: pp. 1-19. Body & Society, September 2006; vol. 12, 3: pp. 75-102. Body & Society, June 2003; vol. 9, 2: pp. 75-95. Body & Society, December 2001; vol. 7, 4: pp. 37-55.